RÖHM Products of America has been named a DMG MORI Qualified Products designer/supplier. The designation indicates that RÖHM provides accessories for DMG MORI machines that have been certified according to rigid performance standards. RÖHM, a global leader in workholding and gripping technology, was founded in 1909 in Germany and possesses a well-established reputation for its advanced engineering capabilities. The company’s extensive best-in-class product offerings range from tiny drill chucks and highly efficient tool clamping equipment, to manual gripping technology and high-tech power clamping tools for workpiece diameters as big as 18 feet. 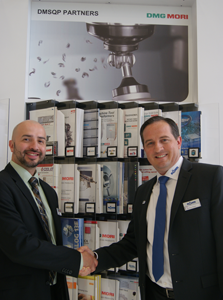 RÖHM has provided workholding products to DMG MORI for many years. The DMG MORI Qualified Products program was created to ensure that every product that works with a DMG MORI machine – whether it is a machining center, lathe, or multi-axis machine – provides peak performance. The company identifies those suppliers that offer qualified products that meet DMG MORI’s standards, comply with the company’s two-year new machine warranty and offer customers single-source support. Headquartered in Lawrenceville, Georgia, RÖHM Products of America, a division of the RÖHM Group, has been a leading provider of high-quality clamping and gripping technologies to the North American metalworking industry since 1978. The company’s broad and powerful product portfolio encompasses drill chucks, live centers, lathe chucks, vises, automation technology, power chuck technology, mandrels, tool clamping systems and customized solutions for turning, milling, drilling and grinding applications. The company also takes pride in providing world-class support and services to ensure trouble-free machining processes for its customers within the aerospace, automotive, energy, engineering, micro technology and rail vehicle manufacturing sectors.